Seeing variouse SSB QRP transceiver designs on the internet I have been thinking about building my own QRP SSB transceiver for almost a year now. 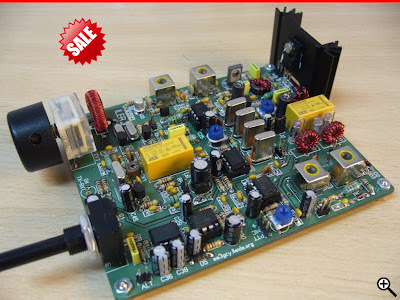 You can start from scratch but also for starters buy one of the many kits availible from variouse supliers like Pacific Antenna/QRP Kits (Hendriks), YouKits, etc. 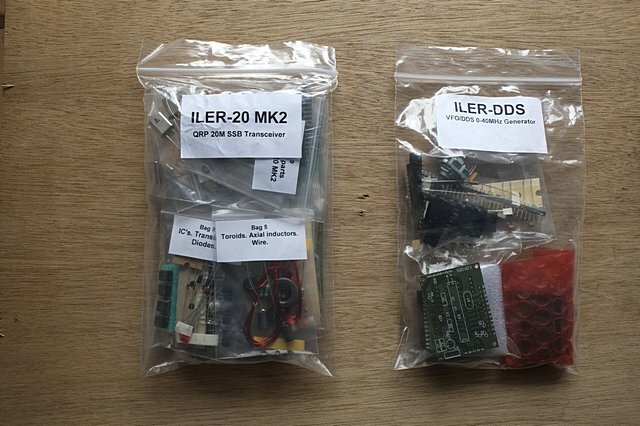 which can be just a bag of components and a PCB, to a more just montage kind of kit like the kits from Elecraft. I choose to start off a little bit easy, so I started looking for a kit should that would include all the components and the PCB. After comparing farious models, my eye focused on the ILER 20 QRP transceiver from Javier Solans - EA3GCY. Note : Javier has a new web store (link). After ordering the kit (and the DDS) and waiting 2 weeks for delivery, on 8 juli 2015, the postman dropped of the package. On the following pages I will try to make a short building report about this kit. Building the ILER DDS - a universal DDS designed by Javier Solans - EA3GCY which can be used on the ILER but also on variouse other kits. Building the LER 20 MK2 - the second version of the famouse ILER 20 kit designed by Javier Solans - EA3GCY. Enjoy the reading and when you have idea's, comments etc. please contact me.